Following a number of verbal barbs swapped between both companies over the past few weeks, the game publisher ZeniMax announced today that they've filed suit against VR company Oculus for "illegally misappropriating ZeniMax trade secrets relating to virtual reality technology, and infringing ZeniMax copyrights and trademarks." The folks at ZeniMax—which publishes games like The Elder Scrolls and Wolfenstein—say that Doom co-creator John Carmack provided technology and information to Oculus before he left ZeniMax subsidiary id Software for the virtual reality company last year. ZeniMax also wrote in a press release today that "[their] intellectual property has provided the fundamental technology driving the Oculus Rift since its inception." Oculus, the company that makes that much-hyped Oculus Rift virtual reality headset, was purchased by Facebook earlier this year for $2 billion. The suit arises from the defendants' unlawful exploitation of intellectual property, including trade secrets, copyrighted computer code, and technical know-how relating to virtual reality technology that was developed by ZeniMax after years of research and investment. ZeniMax provided this valuable intellectual property to defendants under a binding Non-Disclosure Agreement that specifies such intellectual property is owned exclusively by ZeniMax and cannot be used, disclosed, or transferred to third parties without ZeniMax's approval. 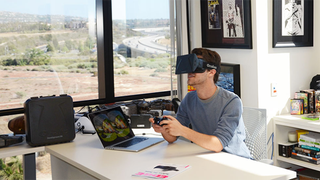 ZeniMax's intellectual property has provided the fundamental technology driving the Oculus Rift since its inception. Nevertheless, the defendants refused all requests from ZeniMax for reasonable compensation and continue to use ZeniMax's intellectual property without authorization. All efforts by ZeniMax to resolve this matter amicably have been unsuccessful. Oculus has recently issued a public statement remarkably claiming that "ZeniMax has never contributed IP or technology to Oculus." Meanwhile, Luckey has held himself out to the public as the visionary developer of virtual reality technology, when in fact the key technology Luckey used to establish Oculus was developed by ZeniMax. "Intellectual property forms the foundation of our business," said Robert Altman, Chairman & CEO of ZeniMax. "We cannot ignore the unlawful exploitation of intellectual property that we develop and own, nor will we allow misappropriation and infringement to go unaddressed." "ZeniMax and id Software take their intellectual property rights seriously," said P. Anthony Sammi, a Partner of Skadden, Arps, Slate, Meagher & Flom LLP which represents ZeniMax and id in this matter. "We now look to the federal courts and will pursue all appropriate measures available under the law to rectify defendants' egregious conduct," he added.